Register with us to receive regular offers as well as specials and golf promotions. New Smyrna Beach Golf at its Best! Hidden Lakes is a true gem! The par 69 layout provides a variety of long and short holes with three par 5's, nine par 4's and six par 3's. It offers the right amount of fun and challenge for the average golfer. The expert golfer will enjoy the back tees and will use every club in the bag. All golfers will appreciate the impressive course condition and beautiful scenery that includes spectacular views of the estuary, stately oaks dripping with Spanish moss, along with osprey, American eagles and other native wildlife. Golfers that want to work on their game will love our practice facility! We hit off real grass 365 days of the year and provide quality range balls. Our short game area, the "Scoring Zone", is second to none. The spacious putting green is a great place to work on your stroke. Looking for a beautiful place to host your wedding or reception, the Banquet Center at Hidden Lakes can accomodate up to 200 for your special occasion. If you need meeting space, we have a well appointed conference room to meet your needs. 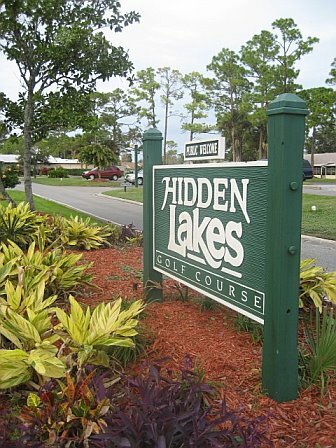 Just a short drive from Port Orange and Edgewater, Hidden Lakes is a enjoyable and friendly golf course in New Smyrna Beach. We feature several membership packages to best suit your needs and budget. With Memberships starting as low as $129.00, what are you waiting for? Give us a call and come take a guided tour of our facility. To get more information on our golf course, our annual or seasonal golf memberships and more, simply call our New Smyrna Beach Golf Pro Shop to speak with one of our golf professionals.